REUTERS/St. Louis County Prosecutor’s OfficeSt. Louis County Prosecutor’s Office photo shows Ferguson, Missouri police officer Darren Wilson photo taken shortly after August 9, 2014 shooting of Michael Brown. 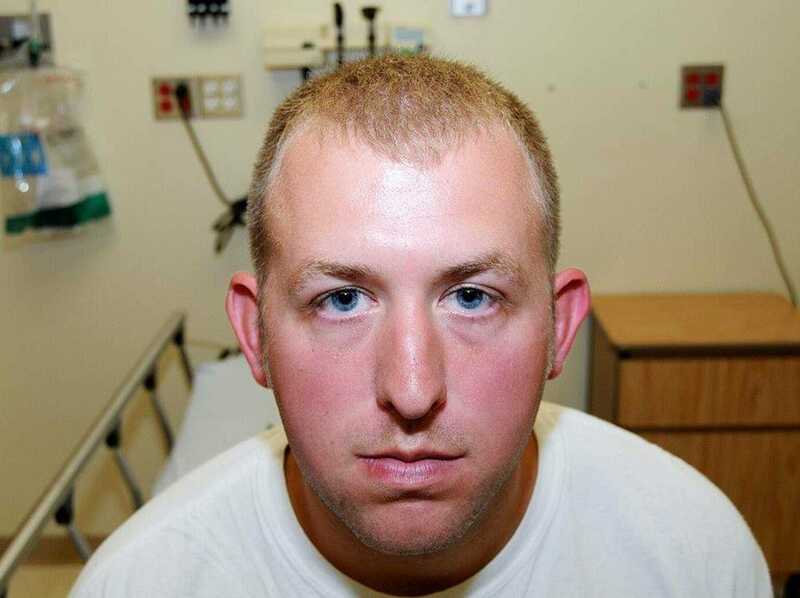 Ferguson police officer Darren Wilson’s grand jury testimony has come out as part of a large release of evidence that has followed the jury’s decision not to indict him. 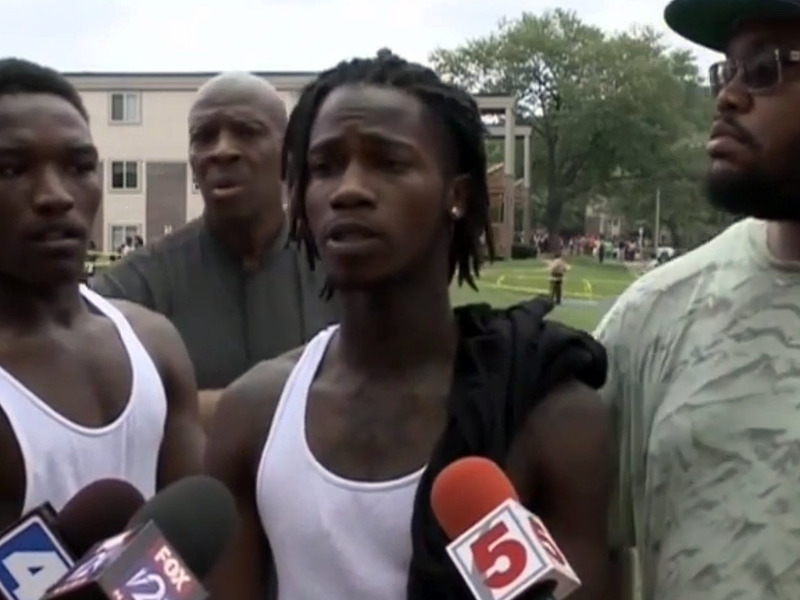 It’s the fullest account we have to date of what Wilson says happened the day he shot and killed unarmed teenager Michael Brown. Wilson has hidden from public view since the August shooting, which sparked large-scale protests in the St. Louis suburb. Officials announced Monday evening that a grand jury decided not to indict Wilson in the shooting. Wilson told the grand jury that he initially stopped Brown and his friend Dorian Johnson for walking in the street. While he was telling Brown and Johnson to get on the sidewalk, he told the jury, he noticed that Brown was carrying a handful of Cigarillos and realised that he’d heard a call earlier that day for a robbery involving the small cigars. He said he then radioed for another car. Wilson said he then opened his door again and used it to push Brown back. Wilson said Brown grabbed the door again and he saw Brown coming into the cruiser. Wilson said Brown then punched him in the face. Brown then reportedly turned to Johnson to hand him the Cigarillos. Wilson tried holding him back, according to the testimony. “When I grabbed him, the only way I can describe it is I felt like a five-year-old holding onto Hulk Hogan,” Wilson said. He said Brown then hit him again. 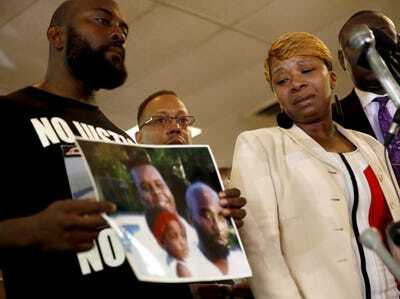 APLesley McSpadden, right, the mother of 18-year-old Michael Brown, watches as Brown’s father, Michael Brown Sr., holds up a family picture. At that point, Wilson said, he thought using his mace would be too dangerous because Brown reportedly had his hands in front of his face and the mace could have gotten onto Wilson and prevented him from being able to see. Brown reportedly then dug Wilson’s gun into Wilson’s hip. Wilson said he could feel Brown’s fingers reaching for the trigger. Wilson eventually regained control of his gun and tried to fire it two times without it working properly. On the third try, a shot fired through his car door, Wilson said. “It looks like a demon, that’s how angry he looked,” Wilson told the grand jury. Brown reportedly hit Wilson again. Wilson fired another shot from his car. “When I look up after that, I see him start to run and I see a cloud of dust behind him,” Wilson told the jury. He then radioed for more cars, he said. Wilson and Brown then started running. Brown eventually stopped, and Wilson said he stopped behind him, telling him to get on the ground. Wilson then started shooting. He said he doesn’t remember how many shots he fired. Brown is still coming at Wilson at this point, he said. Wilson then fired another round of shots. “At this point it looked like he was almost bulking up to run through the shots, like it was making him mad that I’m shooting at him,” Wilson said in the testimony. Wilson continued telling Brown to get on the ground, and Brown kept coming at him, Wilson said. Brown then started to lean forward “like he was going to tackle” Wilson as he got closer, according to the testimony. “When he gets about that eight to 10 feet away, I look down, I remember looking at my sites and firing, all I see is his head and that’s what I shot,” Wilson said. Other witnesses to the shooting have told a different story. Some claim Brown had his hands up in a sign of surrender and was running away when Wilson shot him. Johnson has said that Wilson grabbed Brown by his neck as Brown tried to pull away. Johnson said there was no struggle over Wilson’s weapon. Another witness, Tiffany Mitchell, has also said that it looked like Brown was pulling away from Wilson and Wilson was trying to pull him back. Mitchell’s colleague, who was waiting in her apartment for Mitchell to pick her up for work, has also said that it looked like Wilson was trying to pull Brown into his car. Johnson has said that when Wilson fired the fatal round of shots into Brown, the teenager had his hands up in a sign of surrender. Mitchell has told a similar story. Protests, which at times turned violent, erupted in the St. Louis suburb of Ferguson, Missouri in August after Wilson shot Brown. Demonstrators took to the streets again Monday night after the grand jury announced its decision not to indict Wilson.